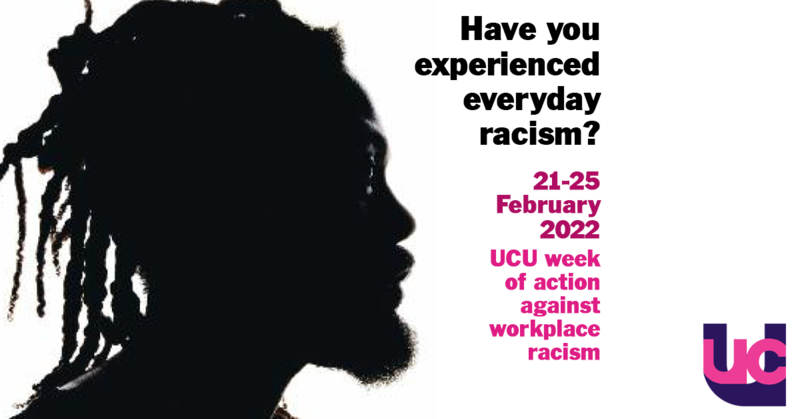 On 27 February 2019 UCU will be holding a day of action against workplace racism. Branches are encouraged to host meetings of all members to discuss issues and approaches in line with the theme '#Blackstaffmatter and how best to engage with colleagues and your institution. As per UCU policy branches are also encouraged to work strategically with their local student union. Below are some resources and suggestions you may want to use to stimulate discussion among members and students. Watch our 'witness' campaign film in which UCU black members speak candidly about their experiences of everyday racism and its impact. Host a meeting to discuss what and how branches can challenge and change perceptions including working with other equality groups to ensure that workplace racism is challenged on an intersectional basis. Use our survey findings from our most recent report ' Staying Power [1mb]' (2019) and our initial 'witness' report [132kb] (2016). Involve black staff to share their experiences of everyday racism in the workplace - devise an action plan of how branches can work toward addressing the issues raised. Share the witness document [824kb] capturing some of the experiences of UCU black members. Use our bargaining guide on tackling workplace racism [343kb] to raise the issues identified with employers as an integral part of the collective bargaining agenda. Submit an article for the 'Black Voices' blog: https://www.ucu.org.uk/black-voices. Please send contributions to Chris Nicholas (cnicholas@ucu.org.uk). Challenging discrimination is a crucial part of UCU's work. The union tackles discrimination both on an individual basis - supporting individual members experiencing problems - and collectively, challenging racism within organisations and across the post-school education sector. We have produced these materials as a tool to highlight the issue in further and higher education workplaces and to engage staff in our campaign. If you would like some of the resources referred to above please contact Martin Whelton . Please let us know what you branch is planning so we can share it with other branches. A February 2019 report for UCU says a culture of bullying and stereotyping means black academics have to work harder and employ mentally draining strategies to try and get on. Initiated by UCU Black Members' Standing Committee, our new film 'witness' chronicles the lived experiences of UCU black members in post-16 education. To view the subtitled version please click here.